We are chained to our handsets so much that we do not want to part with them, but sometimes we do have to. Researchers note that smartphones are almost never more than three feet away from their users. Therefore, the only way for your smartphone to always be with you, is a wearable device. Some rumors say that it is been a year since Apple and Google have secretly begun working on the wearable computers. As for Apple, it promises that people will be able to see information on their upcoming iDevices. They will be able to communicate to the device again though SIRI. Author of the rumor claims: “a very small group of Apple employees” have already begun working to prototype the device. The device will be the hub for our information sharing and gathering. It will give us an opportunity to transmit any information in every period of the time. Internet access will become unconditional. Wearable computer is not something new because a fancy electronic watch can be described with the same term as well. The main factor in this situation is the functionality and feature range of the devices. It seems that the last version of the wearable computer will feature a screen enabling us to augment our vision with information and multimedia. 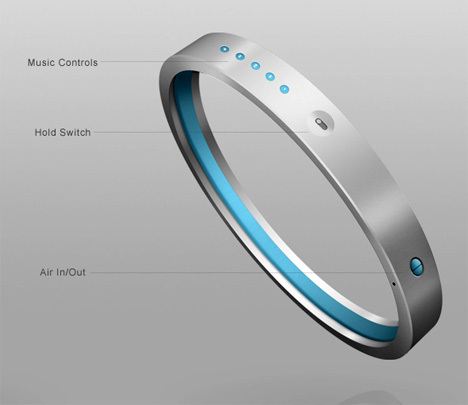 As the picture suggests, the device will look quite similar to a bracelet. Design of the device proves that most people will like it. In a word, it may be some time down the road before the device arrives, but we can fairly assume that this is the logical continuation of the smartphones, because they are overdeveloped by now. As a senior researcher specializing in wearable computing predicts, the next step in technology will lead to blurring of the real and virtual worlds.